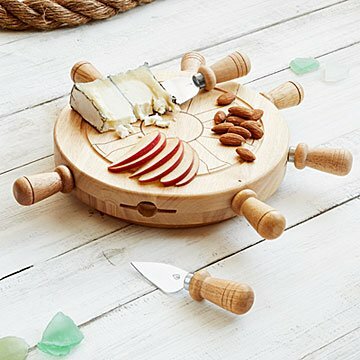 Create a nautical centerpiece with this sea-worthy rubber wood cheese server, shaped like the ship's wheel. Sharp cheddar, starboard side! Create a nautical centerpiece with this sea-worthy rubber wood cheese server, offering four hidden steel cheese tools--a fork, chisel knife, blunt-tipped knife, and pointed-tip knife--in the wheel's magnetic slots. The four remaining handles stay in place, helping you "steer" your display of brie, manchego, and more like a mini Lazy Susan—perfect for seafaring snackers and land lubbers alike. Made in China. Surface wash only with a damp cloth. To prevent wood from warping and cracking, do not submerge in water. Hand wash tools and dry immediately after washing. Now i don't need to lug a cutting board and cheese knives, everything in this! Perfect hostess gift - beautiful and reasonably priced! The product is compact, and turns to allow easy access. The cheese tools are cleverly hidden in the wheel spokes. It's the perfect size for just out of college newlyweds who like to entertain, or just to have as decoration in a small space. This is a perfect gift for anyone for any reason. It is a small-medium size cheeseboard though so not great for big parties, great for a night in, or entertaining in-laws, or friends that pop in to visit! This is a perfect size for serving cheese. It rotates lazy-Susan-style which is really practical for serving a full table of people. The knives are handy, and the design is fun. Has not used it yet as it is not Christmas yet. I felt the packaging could have been a little nicer, other than that I was very happy with the item. Perfect small board for entertaining. We use this on our boat for harbor cruises with friends and family. It's not super big so we cut everything up at home and then display/serve on the cheese board. Great gift. Excellent for daily use or entertaining. Very stylish. Great features. Very well made. The built-in magnets are great for holding the utensils in place.